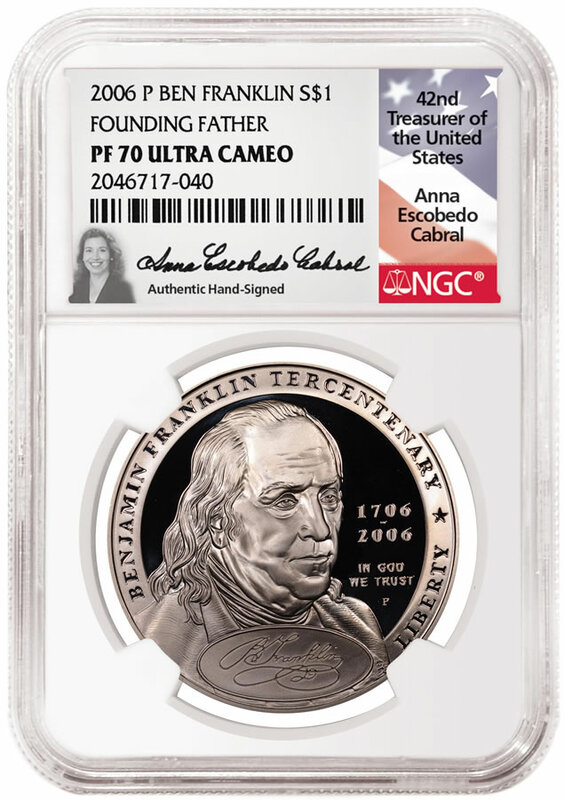 Numismatic Guaranty Corporation® (NGC) is excited to announce that Anna Escobedo Cabral, the 42nd Treasurer of the United States, will individually hand-sign certification labels for NGC. The pairing of a coin from Cabral’s time as Treasurer and an NGC label with her authentic autograph creates a unique collectible with a personal connection to someone closely connected with the coin. Cabral also coordinated on currency design issues with the Bureau of Engraving and Printing, which prints US paper money. Her signature, along with the Treasury Secretary’s, appeared on Federal Reserve Notes issued during her tenure. All series 2003A, 2004A, 2006 and 2006A notes bear her signature. Paper Money Guaranty® (PMG), an affiliate of NGC dedicated to third-party paper money certification, recently launched its own Authentic Hand-Signed Label program with Cabral. This gives collectors a number of options for pairing a collectible coin (such as the 2006-P Ben Franklin Founding Father Commemorative Proof Silver Dollar) with a modern banknote (such as the 2006 series $100 Federal Reserve Note, which also features Franklin’s portrait). NGC offers a variety of popular authentic hand-signed labels, including ones autographed by US Mint Chief Engravers Elizabeth Jones and John Mercanti, 38th US Mint Director Edmund Moy and the "Coinage Congressman" Gov. Hon. Mike Castle. Rising from an underprivileged childhood in California, Cabral went on to earn a master’s degree from Harvard University and served as deputy staff director of the U.S. Senate Judiciary Committee in the 1990s. She served as director of the Smithsonian Institution’s Center for Latino Initiatives, before joining a series of 16 women who have held the office of Treasurer since 1949. Anna Escobedo Cabral Authentic Hand-Signed NGC Signature Labels will be available from select retailers soon. Interested in bulk submissions? Contact Miles Standish at Miles@NGCcoin.com or 1-949-922-0515, or Scott Heller at SHeller@NGCcoin.com or 1-941-360-3990.